In this Harry's Razor review, you will learn that Harry’s Razor is a mail order razor and shaving products company that brings all your shaving needs to your front door after a convenient and easy online order. The market for home delivery has expanded substantially in the modern world, including personal grooming items such as shavings products. Rather than having to venture out to the drug store, find a clerk to unlock the razor blade cabinets, then between $15 and $20, services like Harry’s Razor offer instant online orders, home delivery, all at a fraction of the price. In this Harry’s Razor review, we’ll explore what Harry’s Razor is, what inspired the company and what it offers you, as well as the characteristics of a few major competitors. In the end, you’ll know where Harry’s Razor products fit in with their competitors, helping you decide where to source your blades to keep that face clean. Harry’s is a subscription-based shaving system. Upon choosing a shaving package, the user becomes a member. Membership entails periodic charges and subsequent delivery of refill razors and shaving products. The user may choose to begin with a free trial set or one of two starter set variations. The products can also be purchased individually should the user not desire to begin an ongoing membership. The starter kit is quite economical, as it is free, beyond a $3 shipping and handling charge. It includes a Truman handle and a blade, in addition to a 2oz sample of the foaming shave gel, and a travel blade cover. The starter sets each includes 4oz of foaming shave gel, 3 blades, a travel blade cover, and either the Truman or the Winston razor handles. Let's get into our Harry's Razor review. Harry’s offers two razor body products, the Truman. With each purchase of a razor handle, a German black package is included so you can get to shaving immediately. The Truman was the first razor offered by Harry’s, with a rubberized handle coming in three colors from which to add a stylish accent to your bathroom. The Winston is distinct from the Truman based upon its die-cast zinc body, accented by a rubberized grip. This razor body is more than double the price of the Truman but comes with the added benefit of engraving the chrome finish, allowing you to choose three letters to be etched into the handle. The two razors offered by Harry’s contain the same two German-engineered blade cartridges. Additional packages of cartridges can be purchased at a rate of $16 for 8 cartridges, $2 a piece. A Harry’s Razor review is not complete if the additional products offered by the company are not explored. Beyond razors and blades, Harry’s Razors also offered additional shaving products, and grooming products as well. A feature worth noting in our Harry’s Razor review on the razors is the travel cover. Few razor companies offer a travel cover at all, and the one offered by Harry’s Razor is quite good. The plastic cover prevents access to the blades to stop yourself or your packed items from being cut, and it offers sufficient ventilation to keep it dry and prevent rusting. Harry’s Razors personal care line includes shave-cream for post-shave moisturizing, and post-shave shave-balm to cool your skin after having shaved. The company also makes body wash, and bar soap to cleanse your body after smoothing out your face. 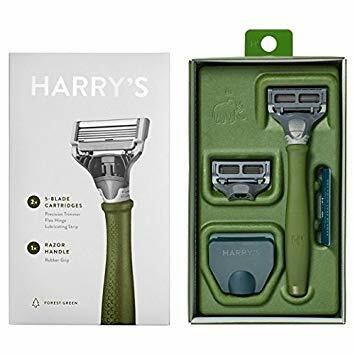 Face wash and lotion, a razor stand, a travel kit, and boxer shorts round out the product offerings of Harry’s Razors. The pricing of the shaving products offered by Harry’s is highly competitive. In terms of individual purchases, the Truman is priced at $9, including a German-engineered blade cartridge and a rubberized handle and handle body. The Winston is $20, including a German-engineered blade cartridge, a die-cast zinc handle body with rubberized accents, and custom-engraving up to three initials for the zinc body. Refill razors come in 8-packs at a price of $16 or $2 a razor. The shave plans offered by Harry’s Razors are chosen based on your preferences. The first option is $15 and comes with one Truman handle, a travel cover, and one blade cartridge. The second option is $30 and comes with the Winston handle including engraving, a travel cover, and one blade cartridge. The cost for additional blades is $2, and they may be sent monthly, bi-monthly, or as often as the user determines. 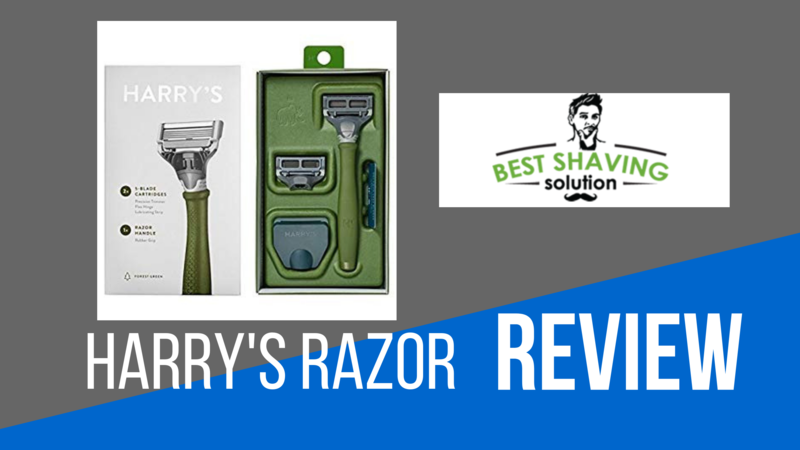 We picked a couple of similar products available on the market to see how they compare to Harry’s Razors, with this Harry’s Razor review presenting you with the choices you need to choose your preferred razor provider. A “shave plan” subscription service or traditional retail online sales outlet, with additional grooming and apparel products available. At a subscription cost of $15 or $30 to start then $2+ a month depending upon how many blades you require, the products are highly affordable. Individual razor handles and blades are just $9 or $20. Accessories are competitively priced as are shave creams, priced $6 to $15. 5 blades, 1 precision blade, and a moisturizing stripe make this a highly comfortable and smooth blade to shave with. The cost per razor is $2, a competitive rate, and you can choose how many you purchase and/or how often you receive them. They come in packs of 8 for $16, and can be purchased each 2, three, or five months. Manufactured in Germany, with heavy handles and carefully manufactured blade cartridges. At a startup cost of $3, $15, or $30, the membership options are very accessible, and at $2 a blade, easy to maintain. The Dollar Shave Club is a subscription shave service that has two variations on razor bodies, in addition to two variations of razor cartridges, much like Harry’s Razors. Refill boxes come every three months with a set number of razors, providing lower flexibility than the competition. The pricing of Dollar Shave Club is competitive. At $5 to start, including a razor handle, 4 razor cartridges, 1oz of shave butter, 1oz of body cleaner, and 3 packets of One Wipe Charlies, the package includes more than any other brand explored. Two blade options, both with a moisturizing strip for your shaving comfort, one with 4 blades, the other with 6, allowing you to choose what your shaving style is. The razor handles initially come with 4 razor refills, and each “restock box” sent each 3 months includes 8 razor cartridges. The design on the entry-level razors with Dollar Shave Club more closely resemble disposable razors than permanent razor handles. The other options, however, are closer to the competition and offer a heavier and more minimalist design. The membership options with Dollar Shave Club are varied and can be changed to meet your specific shaving needs, although generally a “restock box” ships each three months at a price of around $35-40, which includes 8 razor cartridges, a 6oz shave butter, 12oz body cleaner, and a 40ct One Wipe Charlies package. The Gillette Mach3 Sensitive Power Razor is a razor that is readily available at retail chains across America and is built with a plastic body with rubber grips. Many of Gillette’s razors are disposable, but this particular series has a reusable handle and refillable cartridges. The cost of the initial product with two blades is approximately $10. The replacement blades, however, are costly, with 4 packs costing about $19, 8 packs for about $24, or a 12 pack for $27. 5 blades and a precision blade, and a moisturizing strip to add comfort and smoothness to your shave. While more costly in lower quantities, Gillette does offer a number of quantity options to cover your shaving needs as often as you need them. The Gillette razor is lacking in the style and simplicity of the other razors assessed, with its colors and plastic body making it seem more like a disposable razor than a body you want to keep and refill the blades on. Gillette offers retail purchase options at a variety of retailers near you but does not offer an in-home delivery service. Amazon and other online shopping options, however, do carry Gillette, so while you may not be able to join for a subscription shave plan, you can schedule your buys on Amazon to make sure you don’t run out. Merkur’s razor uses a traditional shaving razor blade at a slanted pattern to increase efficiency. The brand positioning is closer to the luxury market than the products explored above and is available from specialty shaving stores and websites. While the initial cost of the razor handle is higher than the competition, the refill blades are a fraction of the cost, evening out the difference in time. Priced at around $50, the Merkur Slant Bar Double Edge Safety Razor is the most expensive amongst the razors explored here and begins to enter the realm of higher priced razors made by designers and metals that can exponentially increase the cost. The refill blades, however, are incredibly affordable at around $3 for 5 blades. While there is only one blade included in the Merkur, it is uniquely designed, and “slanted” for safety, meaning more of the blade comes into contact with your skin while the potential of cutting your self is markedly reduced. The razor handle comes with only one blade; however, the durability and life of the blade advanced compared to traditional multi-blade disposables. The design quality of the handle is similar to the “heavy duty” Merkur 34C, the most popular model, with the top headpiece unscrewing from the base to make it easier to change blades. There is no membership or “shave plan” option available through Merkur, although the products are available through online vendors that allow purchase schedule. In this Harry's Razor review, we have explored a number of leading razors on the market, from “shave plan” subscription services, to readily available retail razors, to rarer luxury market razors. Whatever your personal style of shaving, the choices on the market are extensive. The razors offered by Harry’s Razors are competitive in terms of subscription services, and present higher-end razor bodies from which to choose. At $20 for the zinc-bodied Winston and $2 per refill blade, you can be shaving in style at a relatively low cost, and need not remember to buy blades with the refill options available.